A lot of Test Prescription book news got finalized last week. The title of the book is Rails 4 Test Prescriptions: Keeping Your Codebase Healthy. The publisher wanted the Rails version number in the name, and I want the publisher to be happy. The tentative on-sale date for the beta is June 11. For those of you who were around last time, the beta period is expected to be much shorter. It will include 10 1/2 - 11 1/2 chapters out of 16 planned. My guess, backed up by nothing at all, is that we’ll be draft complete about 6 weeks after that and the print version will be another 6-8 weeks after. All that is subject to change. There’s a cover. I think. I hope to be able to show it soon. Meantime, I’m on a pretty strict 3-4 pages a day to get to the beta deadline. Here are the changes, broadly speaking, between the first edition and the second. Very nearly all the book has been rewritten at least slightly, there’s almost no text that was copied over without any changes. But it goes a lot further than that. I’m quite confident that if you own the original version, you will find most of this new. All tools upgraded to latest versions: Rails 4.1.x, Minitest 5.3.x, RSpec 3, and so on. The opening tutorial was completely re-written. It’s an all new example to provide, I hope, a more gentle introduction to testing in Rails. The code samples in general are better. In the first book, a lot of the samples after the tutorial were not part of distributed code. Most of the samples in this book will tie back to the tutorial, and are runnable. Somewhat more emphasis, I hope, on using testing in practice, somewhat less on duplicating reference information. I’m really happy with how the book is coming along, and I hope you all like it in just one short month. I’ve skipped a few Monday Morning Me’s due to Ruby DCamp and a couple of other things. DCamp was awesome, and maybe beyond my humble ability to do a trip report. In the meantime.. Ground has been broken and progress is being made. Not a lot of ground, and not a lot of progress, but ground and progress nevertheless. So, yay, that. When last I wrote about this, I was debating whether to use MiniTest or RSpec as the main test framework for the book. After a couple of impassioned pro-MiniTest pleas at Ruby DCamp last week, I’ve come around to the idea that MiniTest’s availability and simplicity trump RSpec’s mindshare and ecosystem, at lest for teaching purposes. The first real code section of Rails Test Prescriptions is a TDD walkthrough of adding a first feature to a new project. One of the guiding principles of the book is that I want the advice and techniques to reflect effective practice, or at least effective practice as I understand it. My normal practice for adding a new feature would be an outside-in approach: write an end-to-end test describing the new behavior, then fill in logic with focused unit tests. Normally, I would use Cucumber and RSpec for this. But, as mentioned, the book is using MiniTest instead of RSpec. And I don’t want to bring Cucumber in right at the beginning for similar reasons — too much to explain. So it occurs to me that in the guise of coming up with a testing stack that will make sense to testing novices I have stumbled with the best of intentions into a set of libraries that as far as I can tell is in active use by effectively nobody in the entire world. This is either insane, or so sane that it’s amazing. Statistically, the odds are on insane, but I’d love a second opinion. Do what I’m doing and assume that I can explain it well enough to make sense. I’m open to comments if you have a suggestion. Other than that, it’s just been a matter of getting used to changes in the build tools, and finding an editor setup that plays nicely with the formats that Prag uses. Nothing too bad, though I’m seriously considering that Editorial on the iPad has a real shot of becoming my primary editor for this book (writing it on the iPad next to coding on my laptop). Which is also clearly so insane that it may lap all the way around and become sane again. Obviously, I’ve missed my plan to get something out in September. I have about 30 some odd pages of text, and I’d release it except that some of the sections kind of trail off in mid paragraph. I may just release it anyway, I have a beta reader or two looking at the manuscript to answer that very question. If you want slightly earlier access, let me know via email (noel at noelrappin dot com). And, of course, you can by what exists of the book at /trdd. I’m pleased and more than a little surprised to be announcing the existence of Rails Test Prescriptions 2, (which may not be the final title). You have questions. Even if you don’t, I have answers. Can you give the news in the style of a movie poster tag line? Coming in 2014. It’s time to get your prescription… refilled. Rails Test Prescriptions 2: The re-prescriptioning. Really, just last week. I got an email asking if I was interested (Spoiler Alert: I was. ), and we went very quickly through to contract. Updates to the big tools. Rails 4, RSpec 3, minitest replacing TestUnit. Some deprecations — there are some tools discussed that are basically not anymore. New tools. I think the biggest class of tool not discussed in the original RTP is quick startup tools like Spork and Zeus. I’d like to cover continuous integration options, too, we’ll see if I can make that fit. Over and above all of that, of course, is the fact that the discussion over good testing practice has changed. There’s a lot more talk about maintaining large test suites, writing faster tests, and using tests to drive better Rails application design. I’m planning to talk about that aspect of testing as well. Good question. I’d bet at least spring for the first beta. Ask me again in a few weeks. I assume you are referring to the fact that I have other writing projects in process. I’ve got it under control. Okay, let’s take them one at a time. Well, the nice folk at Ember central were nice enough to release Ember 1.0, making my plan considerably more concrete than it might otherwise be. The Ember team has announced plans to do new point releases every six weeks. My expectation is that through the end of 2013, I’ll fix errors, and come back toward the end of the year to see if there is anything that needs updating or adding. Probably the same through at least the beginning of 2014. Okay. What about Trust-Driven Development? That’s obviously a little more problematic. But I’m really happy with the book, it’s fun to write, and I’m going to keep up with it. The initial release will still come in September, hoping for this week, but that one looks optimistic. Next week is a better bet. That release also triggers a price increase. 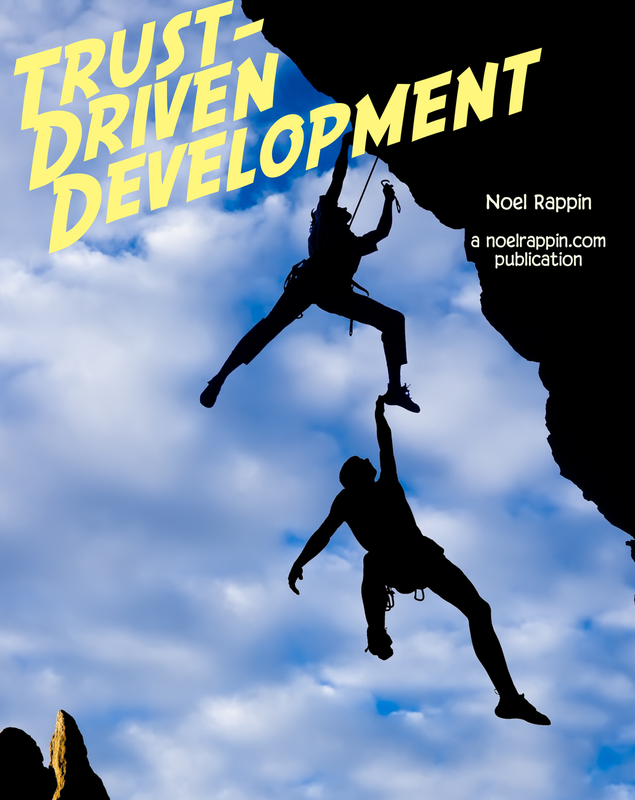 And of course, you can still buy Trust-Driven Development at the fabulous purchase link. After that, I’m not sure. One thing about this book, though, is that it is kind of a nice palette cleaner to break up writing just about code all the time, so I’m actually looking forward to having that as a project during breaks in the Rails Test Prescription 2 process, such as technical reviews and so on. So maybe I am insane after all. Anyway, I’m very much looking forward to revisiting Rails Test Prescriptions, fixing all the things I got wrong last time, and making all new mistakes. Hope you like it.